Our hearts are still heavy in the most recent attack on refugee children that occurred Saturday, June 30th in Boise, Idaho. 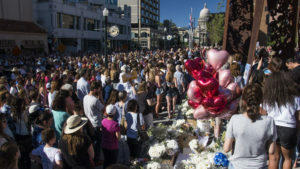 Boise’s community came together for a Vigil on Monday, July 2nd with ‘get well’ cards and handfuls of white flowers in support of these children who were attacked. One of these community members included our nurse, Cordelia Ogunrinola, who is a Nigerian immigrant serving our refugee populations here at Family Medicine Health Center. Cordelia offered her support to these children and remained positive in offering advice to not feel alone, that there are “bad eggs” but they are not what defines this community.